There are five excellent, welcoming golf courses within easy reach of Weobley. We can offer reduced rates for golfing groups of up to 12 playing at local clubs (minimum 2 nights) and our guests benefit from preferential green fee rates at selected courses. The Herefordshire Golf Club - 3 miles. 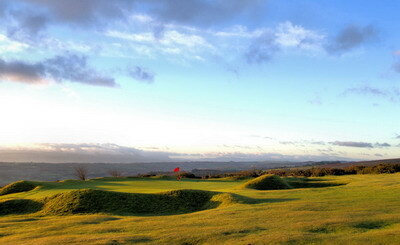 A beautiful course with spectacular views, this 18 hole course is a must for golfing visitors to Herefordshire. PREFERENTIAL GREEN FEES for golfing breaks here are available for our guests. Please ask for details. .One of the finest, natural inland links golf courses and the highest course in England is set on the border of wales just outside the market town of Kington. Has a restaurant and Ten Pin bowling available alongside 9 and 18 hole courses.